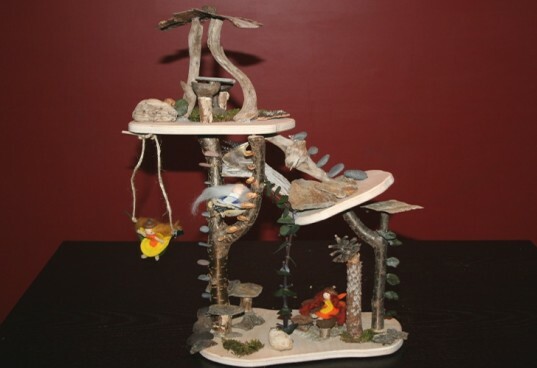 The Original Tree Swing has a wonderful natural craft kit selection that your children will adore. The natural kits are mainly for children ages 6+ but many younger children can participate with the help of an adult. You can find natural crafts like a Fairy House Building Kit, seasonal Fairies, Pirate Map Making Kit, Knitty Kitty, Sail Boat Kit, Wind Car Kit, and a Slingshot Building Kit. The Original Tree Swing sent us some of their Pied Piper Crafts to review and we are thoroughly impressed. Keep reading to learn more about their fun Waldorf inspired crafts! 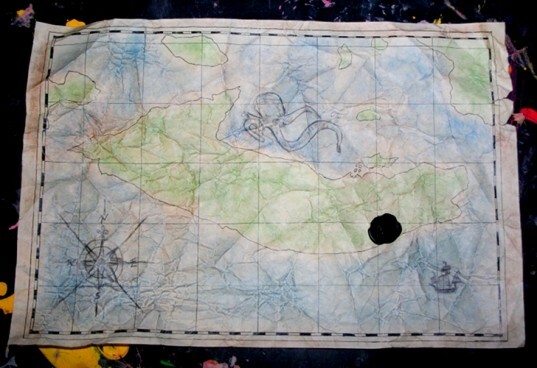 The Pirate Map Making Kit is recommended for ages 6+ but all ages can enjoy. I love how authentic the map looks after designed! The kit comes with 2 11×17 maps, transfer paper, wax seals, colored pencils, a pencil sharpener, and pirate images. You first ball up the map to give it a wrinkled texture. Then you sharpen different colored pencils over the areas to rub in and shade. I love this idea since the shading gives the land and water an even color without pencil markings. You can transfer compass images, ships, dragons, sea creatures, treasure chests, or create your own. For the more advanced artist, you can draw in mountains, rivers, trails and more. I have always wanted to make a fairy house with my daughter, but I never knew exactly where to start. I’d look through images and I could never find the right things in my backyard to build what I wanted. I was so excited to get The Original Tree Swing’s Fairy House Building Kit since it comes with the basic necessities to build a fairy house. The kit includes 3 plywood planks, bark, moss, stones, pinecones, shells, driftwood, string, a glue gun, glue sticks and more. The instructions help you build the base and then the rest is up to your imagination! My 5 year old loved designing the house and coming up with ideas for chairs, beds, swings, ladders, and the decor. Building the house was a fun family project that boys and girls will love building. Every Fairy House needs fairies to inhabit! The Original Tree Swing carries 4 different fairy kits – Spring, Summer, Fall, and Winter. Each season comes with different color combinations for hair, skirts, belts and tops. The kits include wool hair, a wooden head with rosy cheeks and eyes, pipe cleaner, acorn hats, felt clothing, and glue for 2 color coordinating fairies. The fairies are very easy to assemble and are adorable! You can even style their hair. 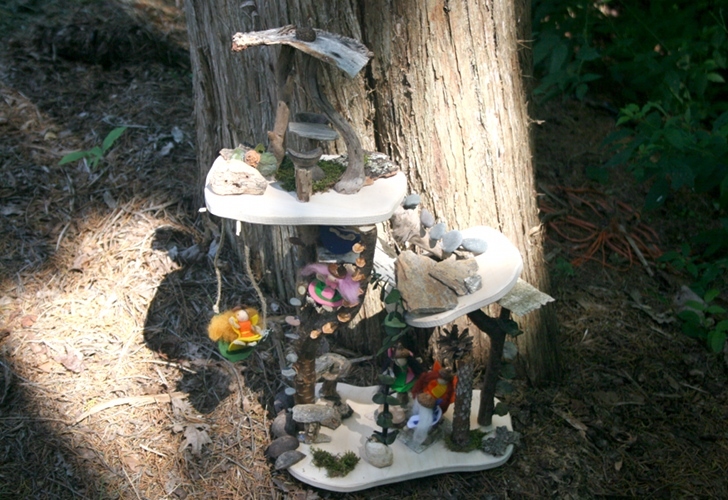 They fit perfectly on the mini furniture you can create for your own fairy house. Knitty Kitty is a learn to knit kit that you can make your own kitten. The kit comes with step by step instructions, including images, on how to knit. Children as young as 5 years old can even learn how! The kit comes with a skein of wool yarn, knitting needles, stuffing wool, yarn needle, gold bell, ribbon, and instructions. You learn the basic slipknot pattern and continue for 20 knitting rows. This craft requires a lot of patience and concentration. My daughter didn’t have the patience to sit and learn the basic knit, but we are going to keep trying. This is the perfect kit for any beginner knitter! The Pirate Map Making Kit is recommended for ages 6+ but all ages can enjoy. I love how authentic the map looks after designed! The kit comes with 2 11x17 maps, transfer paper, wax seals, colored pencils, a pencil sharpener, and pirate images. You first ball up the map to give it a wrinkled texture. Then you sharpen different colored pencils over the areas to rub in and shade. I love this idea since the shading gives the land and water an even color without pencil markings. You can transfer compass images, ships, dragons, sea creatures, treasure chests, or create your own. For the more advanced artist, you can draw in mountains, rivers, trails and more. I have always wanted to make a fairy house with my daughter, but I never knew exactly where to start. I'd look through images and I could never find the right things in my backyard to build what I wanted. I was so excited to get The Original Tree Swing's Fairy House Building Kit since it comes with the basic necessities to build a fairy house. The kit includes 3 plywood planks, bark, moss, stones, pinecones, shells, driftwood, string, a glue gun, glue sticks and more. The instructions help you build the base and then the rest is up to your imagination! My 5 year old loved designing the house and coming up with ideas for chairs, beds, swings, ladders, and the decor. Building the house was a fun family project that boys and girls will love building. Every Fairy House needs fairies to inhabit! The Original Tree Swing carries 4 different fairy kits- Spring, Summer, Fall, and Winter. Each season comes with different color combinations for hair, skirts, belts and tops. The kits include wool hair, a wooden head with rosy cheeks and eyes, pipe cleaner, acorn hats, felt clothing, and glue for 2 color coordinating fairies. The fairies are very easy to assemble and are adorable! You can even style their hair. 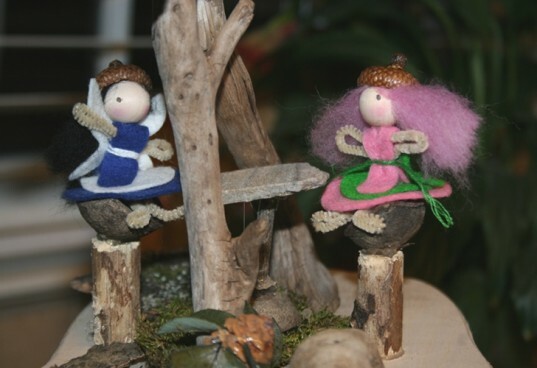 They fit perfectly on the mini furniture you can create for your own fairy house. 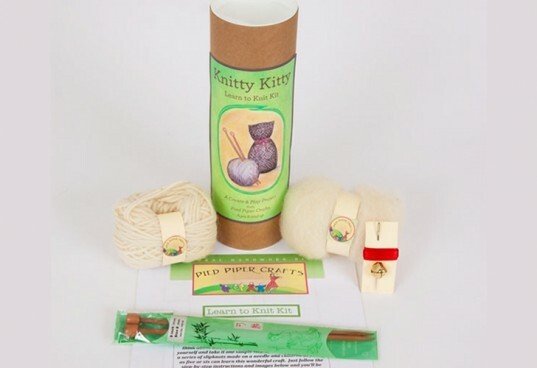 Knitty Kitty is a learn to knit kit that you can make your own kitten. The kit comes with step by step instructions, including images, on how to knit. Children as young as 5 years old can even learn how! The kit comes with a skein of wool yarn, knitting needles, stuffing wool, yarn needle, gold bell, ribbon, and instructions. You learn the basic slipknot pattern and continue for 20 knitting rows. This craft requires a lot of patience and concentration. My daughter didn't have the patience to sit and learn the basic knit, but we are going to keep trying. This is the perfect kit for any beginner knitter!